The India Runner duck is the best egg layer of all duck breeds and if given proper care and good feed will compare favorably with hens in egg producing ability. The Runner is the "Leghorn" of the duck breeds for eggs and a veritable egg-machine when properly handled. It is first of all an "egg" breed, and those who are aiming at breeding for laid eggs should keep it pure. 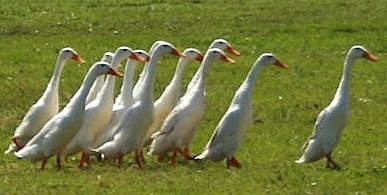 It cannot be styled a "table" duck when compared with other heavier breeds. 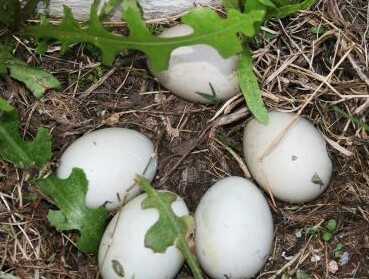 Egg laying ducks are the easiest of ducks to house, feed, rear and manage. Runner ducks have been known to lay eggs while still just less than four and a half months old. It is not common to them to lay quite so early as this. But they do lay earlier than hens, comparatively speaking; they do lay more persistently and they do lay better in the autumn. 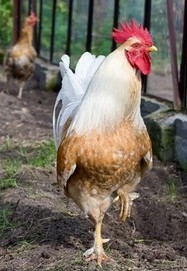 On average Indian Runners lay 180 - 200 eggs a year . When we add these items to the fact that Indian Runners lay an egg exactly one-half larger than the standard size of hens' eggs , and that the English type lay white, translucent eggs, it is easy to see that their value as producers of market eggs is abnormally high. The best thing about Indian Runners is that this duck breed eats less in the way of grain and pellet supplement than big table ducks. 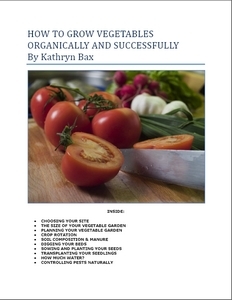 Of course, they should be given calcium and protein-rich food, especially during the extensive laying season. The best egg-producers are those with good carriage, fine heads and necks, good sharp eyes, with their legs well set apart and with very alert appearance. The best layers are easily detected by experienced hands, coarse birds of all descriptions being avoided. The soda-water bottle wants deepening a bit at the base of the neck, and I prefer a bird not so upright. One has to be careful of where you get your Indian runner ducks from as they vary a lot in their capabilities. Trout runners, for example, which are smaller, do not lay as well as a well-bred White or Blue Runner, however, they do have a longer lifespan. It is definitely the strain that counts, and carefully chosen crosses of two unrelated strains of Runner can produce a very good laying bird; inbred types are poor. If you take a midway point between the Buff Orpington Duck and the standard bred White Runner you get the ideal. I think, contrary to most people, I believe, that a rather heavy type of Runner makes the best layer, within reason of course, and not losing the Runner characteristics. The Indian Runner is undoubtedly one of the finest laying duck breeds, and being a "land" breed its main business is to forage and find most of its food in the natural season. They are happy to forage for food, and although can survive on less water, if there is a pond, they will use it. Because they forage keeping this duck breed is economical in feeding and profits on yield go hand in hand. The Runner lays a white-shelled egg, although in a few strains the green egg is noticed, but this character is not true. The white egg should be bred for. As regards color of plumage, any combination is permissible. Some history to this egg-laying duck breed . The Indian Runner duck was first brought from India by a sea captain who, when ashore, had been attracted by their peculiar carriage, active habits, egg-producing powers and foraging merits. In the 1840s he brought a few specimens home with him, and presented them to farmer friends in Cumberland, England. Indian Runners immediately got a good name locally for their egg-laying merits, and the progeny spread over the Scottish border and into Westmoreland. Not till 1890 were the Indian Runners taken up strongly by the fancier, who then realized that the specimens were in many cases losing their original penguin-like appearance, due to the crossing of pure Runner drakes with ordinary farmyard varieties.
" standard-bred " specimens the elevated bottle-like body, balanced in such a manner as to give perfect freedom of movement, and the legs pitched far back, allowing the quick running gait which means foraging capacity. They insisted on the Runner being symmetrically formed and properly balanced with the legs pitched back so that the duck was compelled to elevate the body to such an extent as to bring neck and body into an almost direct line, the profile being suggestive of the outline of an old-fashioned soda-water bottle set at an angle of 50 to 90 degrees. The Indian Runner Duck Club catered for the standard-bred specimen, a comparatively small tightly-feathered duck with very erect carriage, active habits, fine head, wedge-shaped bill, full and quick bright eye, thin and slender neck and lengthy rounded body, with legs set far back. It travels with a straight-out run, and does not waddle or roll like ordinary ducks. When startled an almost perpendicular pose or attitude is assumed. The ideal Indian Runner is a duck with all parts in graceful harmony and showing the most perfect symmetry, proportion and carriage. The head is fine and somewhat flattened over the skull, with eye full, bright, clear, alert and high up in the skull. The bill is strong and deep at the base, where it joins and fits almost insensibly into the skull, and comes as nearly as possible straight down to the tip, giving it a wedge-shaped appearance. The neck is very fine, thin and slender to where it begins to form the expansion towards the base of the neck. This expansion fits almost insensibly into the upper part of the body, so as to appear almost part of it. Head and neck are carried high and slightly forward and must not be curved or swan-like. The body (which includes the lower portion of the neck expansion) is long and narrow, of nearly uniform thickness, very tightly feathered, with wings closely packed and in all approximately twice the length of the neck to the top of head. When standing erect stern appears comparatively short and curves round to the tail, which is close and neat and carried nearly in a line with the body, but in some excellent specimens it is slightly elevated or turned upwards, and a fullness of the lower stern is frequent in the most prolific layers. When on the alert the duck carries neck and body almost in a line at an angle of from 50 to 70 degrees to the horizon. The legs are placed much farther back than in other breeds. The shanks are comparatively short with small supple feet and strong thighs to enable the duck to balance properly and maintain an upright position when on the run. The oldest and best established varieties are whole-colored fawns, pure whites, and fawn-and-whites, but any color or combination is permissible. From the earliest times it has been a distinctive character of the Indian Runner's plumage that the colored body feathers be laced in ducks and penciled in the drakes. The feathers of the duck have dark brownish centers with margins or fringe of a somewhat lighter shade which overlap and give the surface an even shade. The body feathers of the drake are minutely penciled or peppered with darker lines terminating in a fringe or margin of more pronounced tint which imparts an even shade of surface color. At the front of the breast towards the throat the color often deepens a little in drakes. Head, rump and upper part of the tail are of a dark bronze color, often showing a faint greenish luster. In both sexes the body color lightens as season advances and continues to fade until the moult sets in. In fawn-and-whites even clean-cut markings are preferred. tan. The whites have bright orange legs and feet and orange-yellow bills. So, if you are looking for the best laying duck breed, the Indian Runner is your duck, and would be a rather amusing addition to your farms and homesteads. Do you have any Comments on the Indian Runner of your Own? If you do we would love to read them! Send us your input on the Indian Runner duck breed. You don't kneed any special skills to contribute. As long as you can type and use a keyboard, you will be able to submit your contributions here. how many eggs does an Indian Runner Duck Lay?